The Cumberland & Dumfriesshire Farmers Mart had forward 2,547 ewes with lambs at foot at their sale at Longtown on Tuesday 24th May, 2011. Another large show with more numerous distant buyers saw trade still dear. Hoggs with singles sold to a top of £100, £97 and £96 for Greyface Mules from Messrs Ridsdale, Yewtree, others to £97 and £93 Briggle, £94 Knells; Texel £83, £82 Reagill Grange, £76 Easter Frew and Crossgates; Suffolk cross £73.50 Haithwaite. 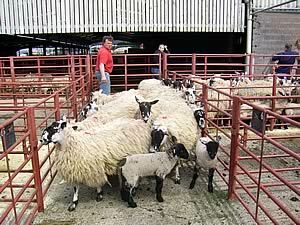 Hoggs with twins to £70, £65 for Greyface from Easter Frew; Texel £66 Easter Frew and Crossgates. Shearlings with twins to £75 for Greyface from Jardine Hall, £70.50 and £70 Cottages, £68 Easter Frew; Texel £60 Low Northsceugh and Colte Coates; Charollais £62.50 High House; Cheviot £60 Easter Frew. Shearlings with singles to £75 for Greyface from Jardine Hall, £68 Easter Frew; Suffolk cross £62 Hopestead; Texel £60 High House and Low Northsceugh. Ewes with twins to £77.50 for Texels from Bayles, £75.50 South Mains; Greyface £66 Low Old Shield, £65.50 Cottage, £64.50 Bayles; Suffolk £75.50 South Mains; Charollais £67 Low Old Shield; Hill Cheviot £54.50 Easter Frew; Lleyn £52.50 Bayles; Masham £52 South Mains; Blackface £45 Bayles; Swaledale £45 Glendhu. Ewes with singles to £74 for Greyface from Borthwick Brae; Texel £71.50 Colte Coates; Charollais £67 South Mains; Suffolk £65 Haithwaite; Cheviot £59 Castlefairn and Haithwaite; Masham £52 South Mains; Blackface £45 Bayles, £44 South Mains. Geld hoggs to £87 for Texels from West Wharmley. Store hoggs to £62.50 and £59.50 from South Mains. Cast ewes to £90.50 West Wharmley.